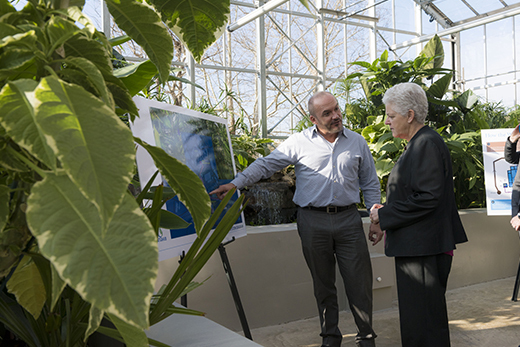 EPA Administrator Gina McCarthy (left) with Ciannat Howett, director of Emory’s Office of Sustainability Initiatives, during a Feb. 5 tour of Emory’s new WaterHub reclamation facility. 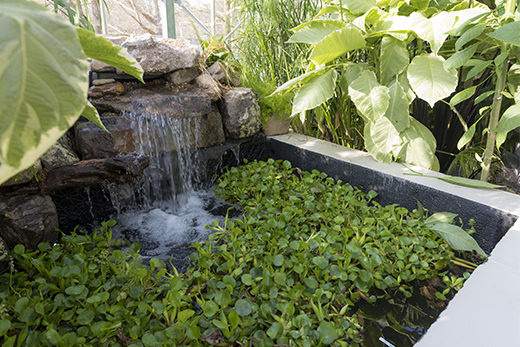 Emory’s WaterHub uses natural processes to reclaim wastewater. McCarthy with Brent Zern, assistant director of operational compliance and maintenance programs for Emory Campus Services. McCarthy examines water cleaned at the Emory WaterHub, displayed in a Southern-style Mason jar. 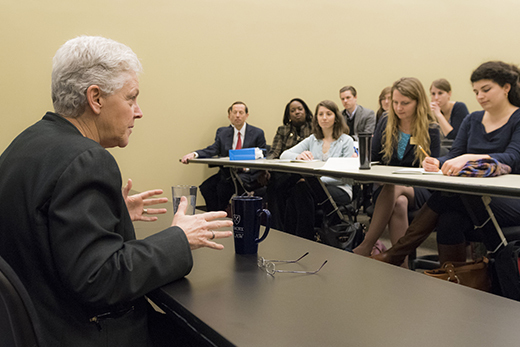 McCarthy spoke with law students from the Turner Environmental Law Clinic for over an hour. 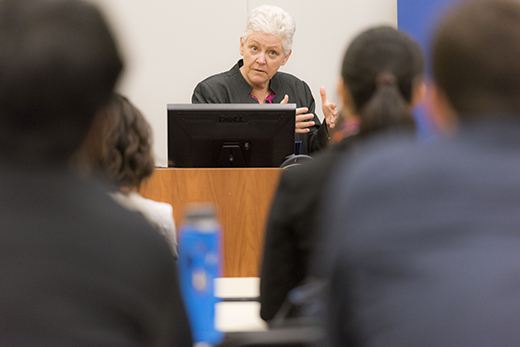 McCarthy urged law students to connect environmental and economic issues. Emory Law students listen to McCarthy. 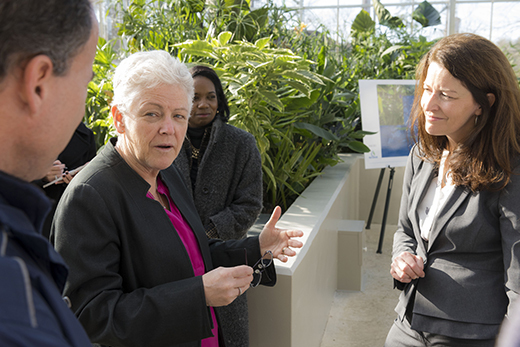 McCarthy is known for her common-sense approach and her passion about the changing climate. 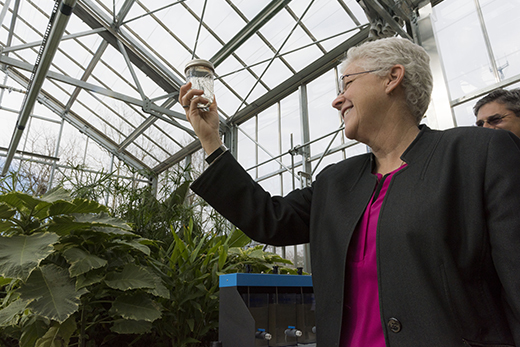 Gina McCarthy, administrator of the U.S. Environmental Protection Agency, is closely contemplating four Mason jars, lined up neatly in order: from murky liquid to crystal clear. "And how long does this process take?" she asks Jonathan Lanciani, CEO of Sustainable Water, the company that partnered with Emory to create its innovative new water reclamation facility. "Twenty-four hours, start to finish," he answers, adding, "You can take one of those jars as a souvenir if you like." "I’d never get it through security," McCarthy deadpans, getting a laugh from the small group gathered in the greenhouse-like WaterHub located just off Peavine Creek Drive. McCarthy has a quick wit, but her Feb. 5 visit to Emory’s campus was serious business. 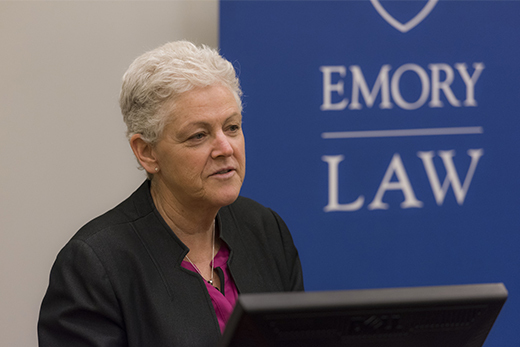 Partly at the urging of her chief of staff, Emory Law graduate Gwen Keyes Fleming, she came to tour the new WaterHub and to speak with a class of environmental law students at the School of Law. At the WaterHub, she was greeted by Ciannat Howett, director of the Office of Sustainability Initiatives, who offered an overview of the project. "We have an opportunity here to model best practices in water stewardship and build a culture of conservation," Howett said. "And we hope to further the acceptance of reclaimed water." McCarthy had a number of questions for Lanciani and Brent Zern, assistant director of operational compliance and maintenance programs for Emory Campus Services. The facility, which uses a natural, plant-driven treatment process to clean and repurpose campus wastewater, is expected to save Emory nearly 110 million gallons of potable water annually by replacing drinkable water previously used for processes that don’t need it. "This sort of project is important for the EPA," McCarthy said. "We have to start treating nothing as waste." McCarthy was particularly interested in Emory’s agreement with DeKalb County, which will ultimately benefit from the increase in available potable water and from the significant reduction in wastewater flowing to its treatment facilities. In addition, she was curious about the WaterHub’s possible application to agricultural water needs. "This may be an alternative that the agricultural community would readily embrace," she said. "It’s very exciting." McCarthy also was impressed with the research component of the WaterHub, which was a key focus in a recent class co-taught by Christine Moe, Eugene J. Gangarosa Professor of Safe Water and Sanitation in the Rollins School of Public Health (RSPH) and director of the Center for Global Safe Water at Emory, and Amy Kirby, assistant research professor in Global Health at RSPH. McCarthy spoke with Kirby and Gloria Sclar, a graduate student who helped lead the course. "It’s great that this campus has such a strong health care component," McCarthy said, "because that’s where you really have to tie these issues together." At the law school, McCarthy was introduced by Dean Robert Schapiro to about twenty students from the Turner Environmental Law Clinic. She described some of the successes and challenges of her tenure at the EPA, where she was appointed as assistant administrator by President Obama in 2009 and confirmed as administrator in 2013. Known for her common-sense approach to environmental issues, McCarthy emphasized to the future lawyers the need for nimble, practical thinking in a fractured and contentious political climate. As EPA head, "I need not just what’s legally available, I need what’s legally available and doable," she said. She is passionate about the climate — particularly air quality, one of the EPA’s most critical challenges and an issue that has the president’s attention. "We have to use every skill set we have to do outreach and explain to people why this is an important issue for them," she said. "The EPA is doing fundamental public health work. If this is a polar bear and iceberg issue, I’ve lost before I even start." And she urged the students to connect the dots between environmental stewardship and a strong economy, which go hand in hand. 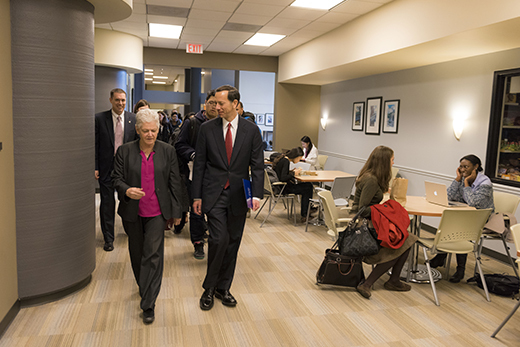 "We have to sell anything the EPA is doing in terms of its economic viability," she said. "The president understands that if you cannot breathe, and your children cannot go to school, you cannot climb the ladder to greater economic success. 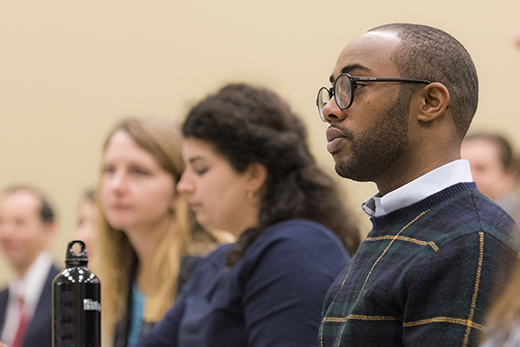 If you become environmental lawyers, you need to advise your clients in a way that stops the segregation of discussions about the environment from discussions about fundamental economic policy, because [as issues] they have never been segregated." Students’ questions touched on topics ranging from transportation to air quality standards to the viability of nuclear power. Responding to the latter, McCarthy said the EPA’s focus is regulating fossil fuel power plants, and pointed to the Clean Power Plan proposal the agency brought forth last year. "We have the opportunity to change the dynamic of the world, and everywhere I go the conversation is about the Clean Power Plan," she said. McCarthy encouraged the students to use their voices, reminding them that the environmental movement was not created by the government, but by members of a concerned public. "One of the great things about coming here," McCarthy said, "is knowing there is a next generation that is going to care and get involved."